As I wrap up my graduate program in Organizaion Development, I continue to elevate the quality and impact of my consulting practice by incorporating what I’m learning with my clients. I’m also sharing more photos of my work these days via twitter highlighting some of these success stories. 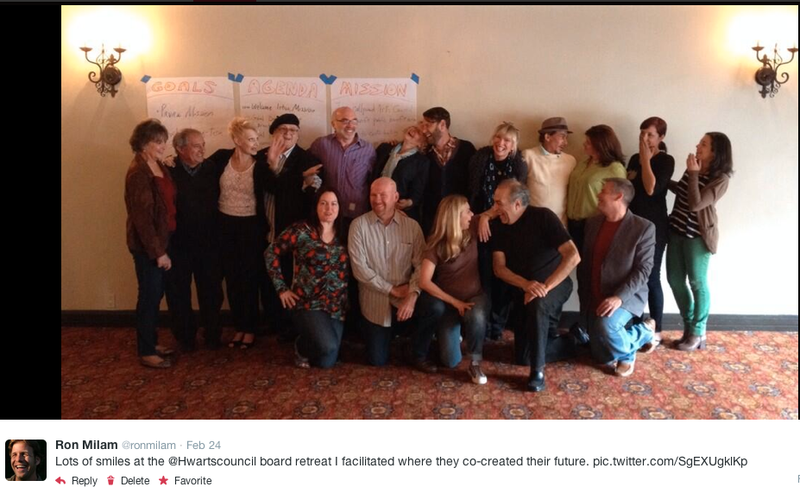 The picture above along with this one are from a one-day retreat I facilitated for the Hollywood Arts Council. I used a new method to gain consensus on long-term goals faster that I’ve ever done with any group, using a combination of individual reflection, paired conversations, groups of four and then eight for this group of around 24. I then facilitated my first ever “fishbowl” conversation which wound up being a very dynamic method for having a critical conversation about leadership development (1st picture). 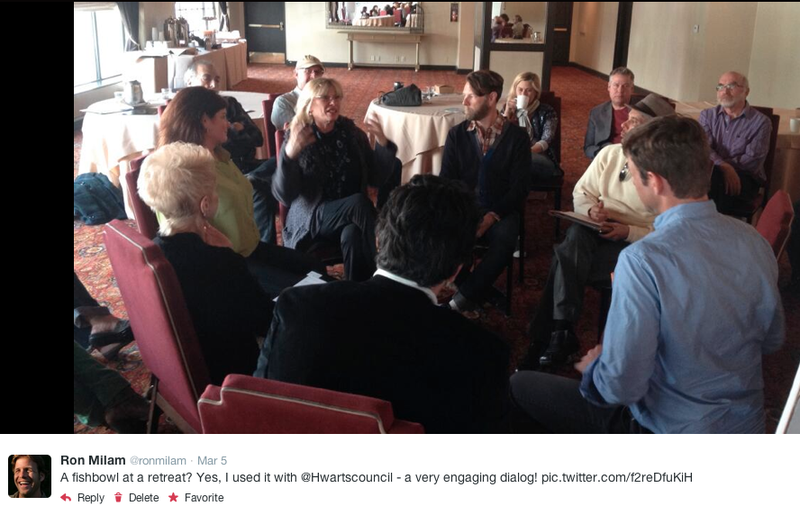 Earlier in the year, I partnered with one of my Affliates, Jill Sourial, and we co-facilitaed our second gathering for the San Gabriel Mountains Forever Coalition. We helped this diverse coalition of local and national organizations develop a strategy that will help protect our local treasurer. I’m a big proponent of going someplace that feels far away, but that is actually quite close (the most traffic on my website goes to my 50+ Places to Retreat in Southern California). 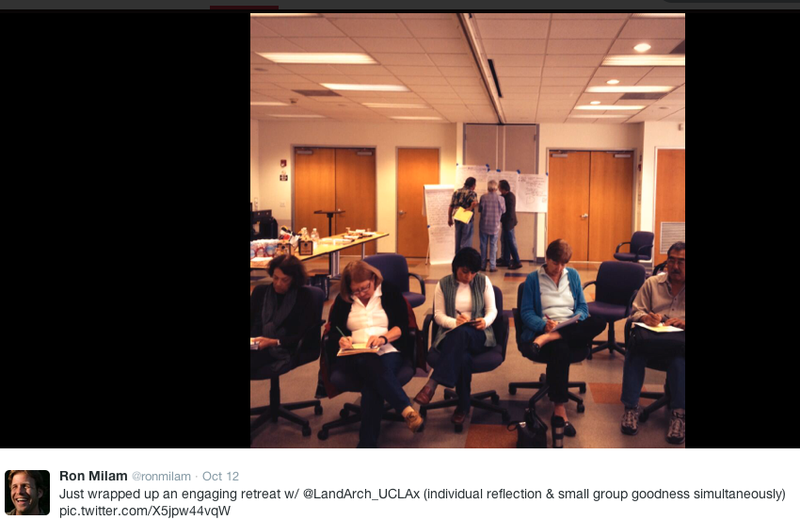 For this session, we met at the Beautiful Eaton Canyon Nature Center and built a walking meeting into to day after lunch for more informal dialog and relationship building among participants. Outside of the country, I facilitated my first session in China along with three other team members as part of my graduate school curriculum. We planned and facilitated a very engaging, 2 1/2 day session working to strengthen the leadership of the NGO participants and increase the influence of their network. We used a variety of organization development best practices and approaches: Appreciative Inquiry, Open Space, Fishbowl, walking meetings, network mapping and more. All of these were variations of a larger method called Future Search which helps participants co-create their future together. Back home, I recently facilitated another retreat for the Little Green Fingers Collaboration. One of the ways in which I know clients value my work is when they ask me to facilitate additional retreats for them. We used the day to share success stories, learnings and plan for the future. I helped them map out possible futures using a combination of mind mapping and then an open space format for three smaller groups to develop possible future scenarios. Through the process, we generated a lot of great discussion and strengthened the existing collaboration. 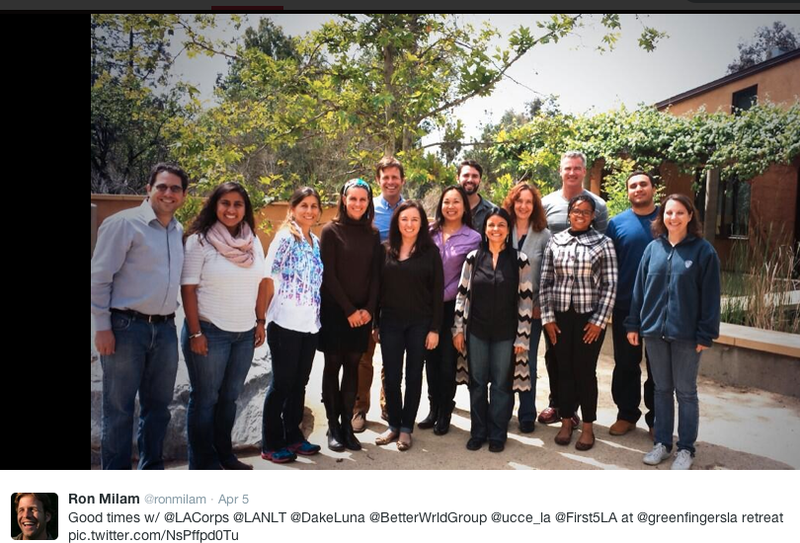 I’m now part of the First 5 LA network of consultants and hope to facilitate more of their collaborative projects like this one. We held this retreat at one of my favorite locations, the Audubon Center at Debs Park. 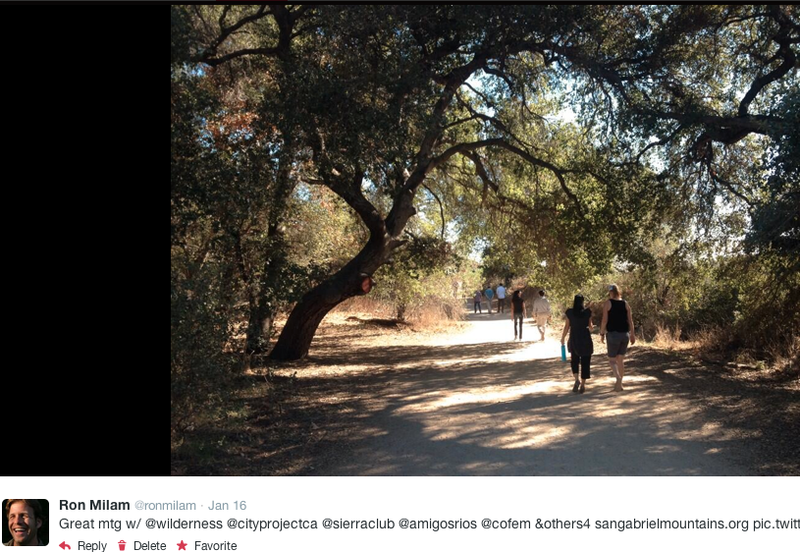 Like the session we had in Eaton Canyon, we used some time during the retreat to walk and talk. These days, I’m doing even more team building sessions designed to build relationships and increase the overall effectiveness of how groups work with each other. 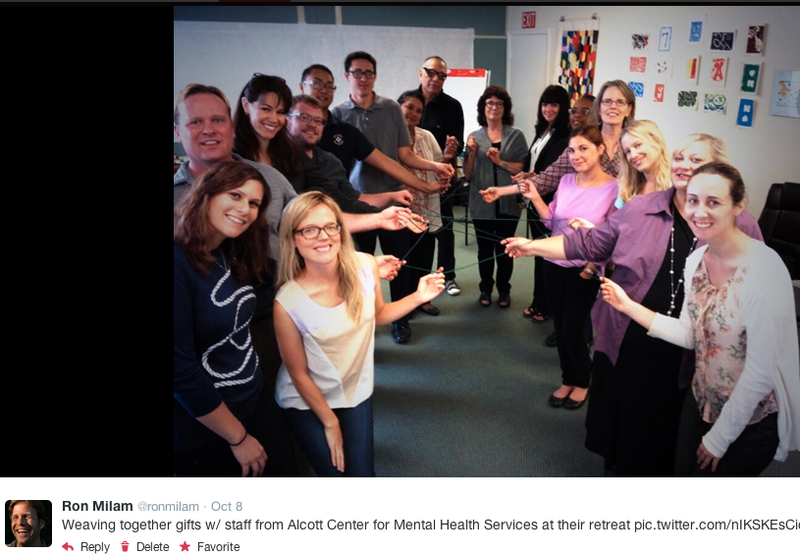 I brought an Appreciative Inquiry lens to a retreat for Alcott Center for Mental Health Services where we weaved everyone together at the start with a round of affirmations that brought out some beautiful dialog and relatedness. Another thing that worked really well for this retreat is I facetted the staff in the morning, board members arrived at lunch for an informal lunch and quick introductions, and then I worked with the board in the afternoon on some topics they wanted to discuss. It wound up being a really nice way to connect staff and the board. 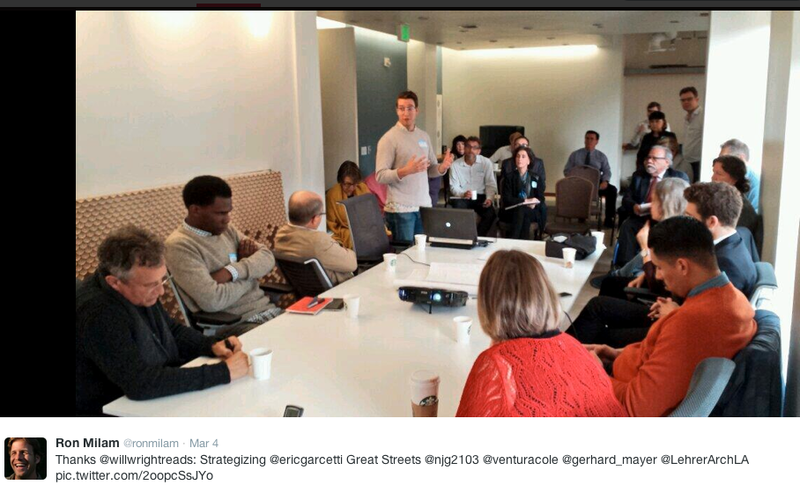 When I received a call from Mayor Garcetti’s office to help plan and facilitate a design charette convening multiple stakeholders to develop their Great Streets Initiative, I said absolutely. I helped design the session that included three break-out sessions where participants shared ideas to transform different streets in Los Angeles. We then reflected on the process and staff from Garcetti’s office used the session to help refine this initiative which the Mayor later announced the first of 15 streets designated during his first State of the City Speech. Given how busy I am with wrapping up my thesis for grad school, being a new father and serving multiple clients, I’m not able to do much pro-bono work these days. My service to the City of Los Angeles is where I make an exception. I’m happy to serve my native city as a citizen. On the topic of community, I recommend Community: The Structure of Belonging). 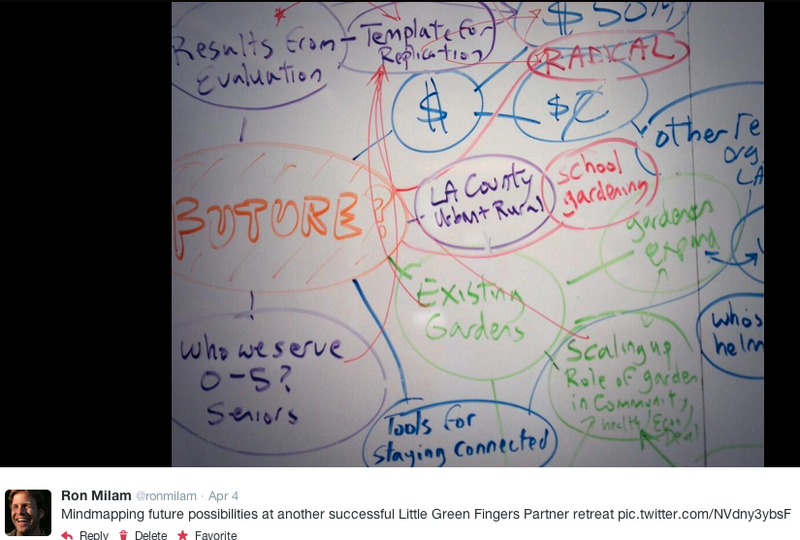 Late last year, I facilitated a retreat for the Los Angeles Community Garden Council Board of Directors to help them refine their mission and vision. Of all the groups I’ve ever facilitated, they most took my “and I encourage you to draw pictures” on the post its I’m asking you to share your vision on. 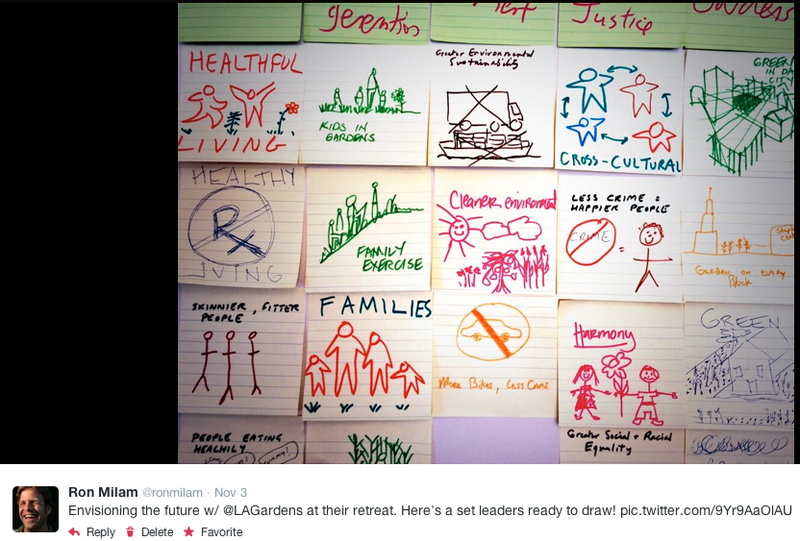 Using this graphic facilitation technique, this created a beautiful collage that helped them reach consensus on specific language to guide them forward. For the UCLA Landscape Architecture Program, I planned a session for all of their instructors to engage in dialog around proposed changes to the curriculum. One thing that I had never done was spin off a small group to continue refining some priorities the larger group developed while the larger group moved on to the next agenda item. All of the activities at the retreat related to making a change to their organizational culture. 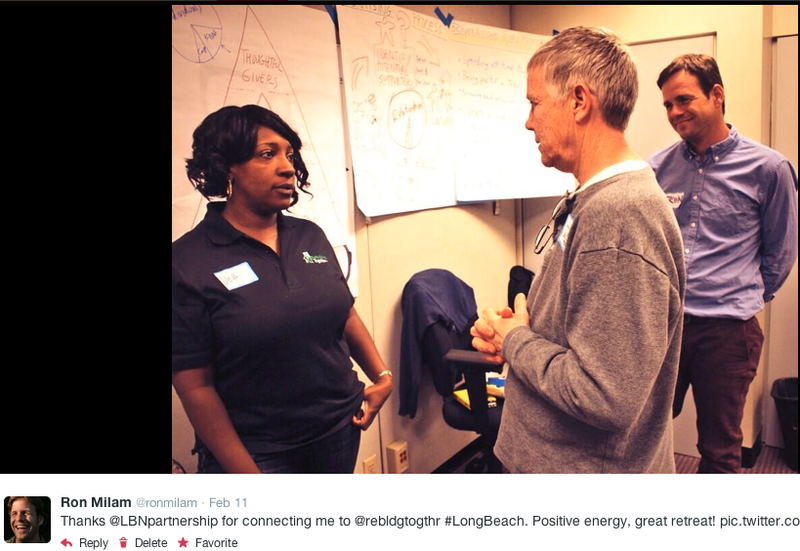 Finally, I facilitated a session for the Rebuilding Together Long Beach Board of Directors and combined a training and a retreat into one to help this organization transition into building a base of donors. I shared best practices, gave the group an opportunity to practice them in real time and then facilitated conversations to debrief and harness the learning. The retreat worked to build awareness of what’s needed, provide skills needed, give an opportunity to practice those skills and then develop an action plan for moving forward. These practices are based on a Simureal approach to change, giving participants the opportunity to practice and reflect. Good times! So what’s next? Plenty! Trevor Project asked me to facilitate their staff advance this year and I’m starting work on that. In addition, I’m also working on the several other exciting projects with XPRIZE, LA-Más, Little Tokyo Services Project and the Islamic Shura Council of Southern California. And if you have any other suggestions, please contact me. Thanks. 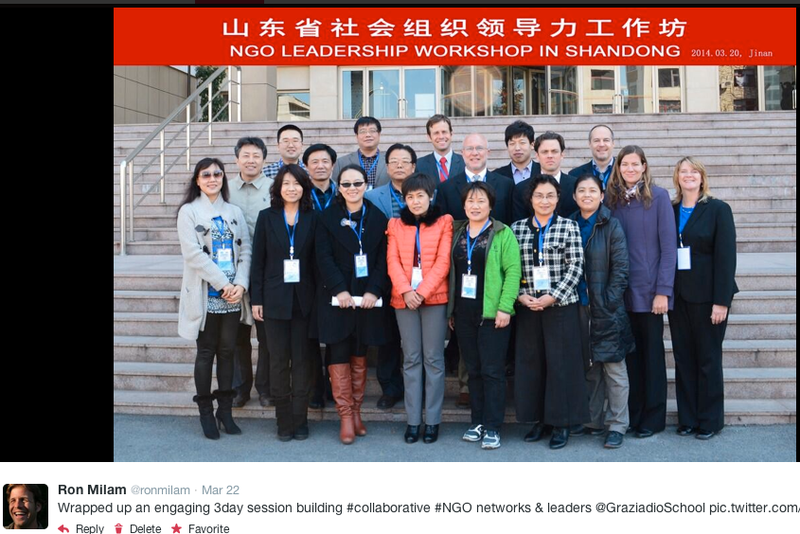 This entry was posted in My Clients and tagged #Nonprofit, #NPLA, Board Development, boards, Clients, Collaboration, Community, Facilitation, Leadership, Retreats, Staff, Team Building, Training. Bookmark the permalink.